All the scientific activities of the 10th World Congress of EWRA, 5-8 July 2017 will take place at Wyndham Grand Athens (five-star hotel), 2, Megalou Alexandrou Street, Athens, Greece. The hotel is easily accessible and conveniently located, offering luxury accommodation and view to the Acropolis. Internet access is free in all rooms and in all premises of the hotel. The hotel is linked with all the picturesque and historical sites of Athens through the Athens transportation system or on foot. It can be reached from the airport through the “Athens Metro” transportation system (for details please see the Guide to participants). 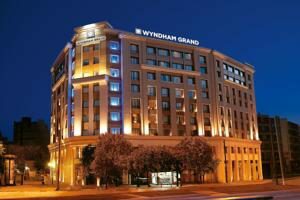 Wyndham Grand Athens offers special prices for the participants of the Congress (including breakfast and all taxes) and particularly for early booking. Special prices can be obtained only by booking your accommodation through the dedicated web service: EWRA2017 – Wyndham Grand Athens. The participants have to book their accommodation by directly contacting the hotel. To be given the above prices they should mention the EWRA Congress “Panta Rhei”. The Stanley hotel can be reached by metro (metro station “Metaxourgio”) and is next to the venue of the Congress. Fitness Centre and Wi-Fi are free of charge at the hotel. In the area of the venue there are also many other hotels at various levels and prices. Needless to say that there are numerous hotels for quality accommodation in central Athens.